I'm guilty of partaking in Couchella 2014. There was a time in my life when I may have wanted to be there (though Bonnaroo has, in the past, appealed to me more), but these days I'm much happier to be getting a great view of the action from the comfort of my couch (or bed). I cherry picked through this past weekend's lineup and watched some bands whose music I really enjoy, and watched some bands I've only briefly heard of in the past. I found myself really enjoying MS MR. Some of the acts, big and small, seemed awkward on those stages, unable to utilize the space or fill it with their presence. But this was not at all the case for MS MR, whose vocalist Lizzy Plapinger commanded not only the stage, but all of Indio, California for a moment. 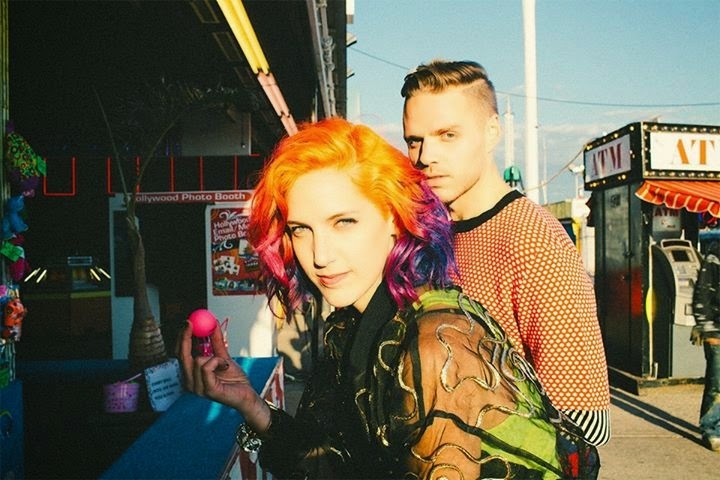 Indie pop group MS MR (pronounced Miz Mister) consists of Plapinger and producer Max Hershenow, who both graduated from Vassar College in 2010. The New York-based duo released their debut album "Secondhand Rapture" just last year, after having come together organically. Hershenow told Interview magazine: "We hadn't even dreamed of making our own music ... All these things that happened came about in the most organic way." Of the duo's musical style, Plapinger said, "We want to create candy-colored worlds with a gothic, macabre underbelly." Hershenow added: "We find inspiration in unexpected contrasts, like a bloodied hand colored in pastels ... Our best work combines disparate ideas that don't naturally work together—that don't make sense."